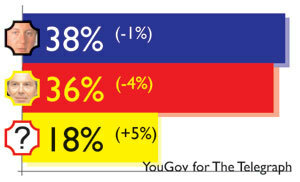 The latest Telegraph/ YouGov poll confirms the recovery of the Liberal Democrats. A 5% bounce back from their troubles of January has hurt Labour and helped David Cameron’s Conservatives reassert a narrow 2% lead. But YouGov also discovered that Labour’s flip-flop attack on the new Tory leader may be bearing political fruit. 63% of those questioned by YouGov agreed that David Cameron "talks a good line but it is hard to know whether there is any substance behind the words". lead. The projected Tory share of the vote is down 5% on last month with the LibDems up 3%. Half of MORI’s respondents were unwilling to express an opinion on David Cameron at this early stage of his leadership but of those who did… the Tory leader was satisfying twice as many people as he was dissatisfying. MORI also found that "Defence/foreign affairs/terrorism is regarded as the key issue facing the country (34% of the public spontaneously say this) ahead of the NHS (33%), race relations/immigration (30%) and education/schools (28%)."